Mike Rizzo finally made the deal every single person in any way affiliated with the Nationals had been clamoring for since April, landing a pair of proven late-inning relievers in Ryan Madson and Sean Doolittle from Oakland in exchange for proven not-late-inning reliever Blake Treinen and prospects 3B Sheldon Neuse and LHP Jesus Luzardo. After an off 2016, Madson has returned to his peak form this year, striking out nearly a batter per inning and walking just 1.5 per nine en route to a 2.27 ERA and 2.65 FIP. … Madson is a good bet to be a strong setup man, at least for the rest of this season, and his hefty contract means the price in prospects will be limited. While he suffered another injury this season, his numbers demonstrate his value when healthy. In 19 1/3 innings, he has 28 strikeouts to just two walks. … Additionally, he’s on a very team-friendly contract that pays him $2.6M this year and $4.4M next before $6M and $6.5M team options in 2019 and 2020. 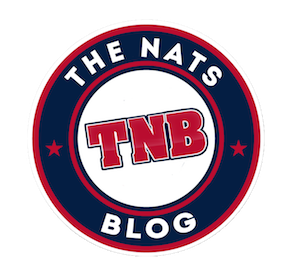 If not for the depth of infielders in the Nationals farm system, it is easy to imagine that Neuse would have been entrenched in High-A Potomac’s lineup by the time of the trade. Instead, he had been at Low-A Hagerstown, where he combined a solid plate approach with above-average power. Defensively, he can play multiple infield positions and managed to be a capable option at both third base and shortstop for the Suns. The keys to him reaching the majors will likely be whether he can continue to play multiple positions, and if his power translates to higher levels. At a minimum, his plate approach should at least allow him to be a solid hitter with good on-base skills. Luzardo came into the year as something of a wild card—a young hurler with unquestioned upside, but also one whose recovery from Tommy John surgery would be watched closely. In a very limited sample size, the left-hander was sharp in the Gulf Coast League, where he struck out 15 batters in 13.2 innings over three starts without issuing a walk. While the 19 year old is likely going to need a few seasons to develop, he was in a position to be one of the Nationals’ top pitching prospects going into 2018, and may have been considered the best pitcher in the farm system depending upon the status of Erick Fedde. Before his injury, Luzardo had a chance at being a first-round pick, and he will look to show that upside as he works his way back from Tommy John surgery. His development will likely take years, but the A’s will hope that he emerges as one of their best pitching prospects. The “who got what” rundown provides important information, but you can get that anywhere. So let’s get to the important stuff: What does this trade mean for the bullpen? First and foremost: It’s a lot better. Oh man, it’s so much better. 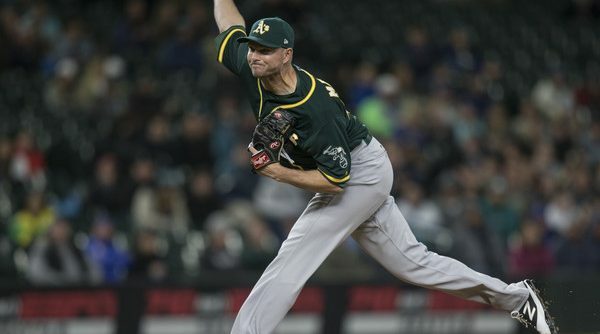 Our very own Court Swift wrote today about the upgrade that Doolittle and Madson represent and who could be the odd man out when everyone returns to health. Second: The Lerners finally ponied up. They’ve famously resisted adding salary at the trade deadline (going so far as to make the Phillies pay down Jonathan Papelbon’s contract) and in paying relievers (they reportedly sunk deals with Greg Holland and David Robertson, two of the league’s best closers this year, over salary concerns). But they’re on the hook for around $5 million for Madson and Doolittle for the rest of this season and over $12 million for 2018. All it takes is for a problem to fester visibly for three months and enrage every single player and fan, I guess. Related to the Lerners’ profligacy is that the Nationals managed to hold on to their best prospects. 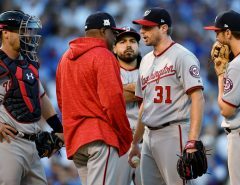 The Washington Post has reported that the team considers Victor Robles, Erick Fedde, Juan Soto, and Carter Kieboom as untouchable in trade talks. Not only did the team leave that group intact in acquiring two late-inning weapons, but it also held on to Andrew Stevenson, arguably a better prospect than Luzardo and the Nats’ chief trade chip because he plays the same position as Robles. Along with Daniel Johnson, Rafael Bautista, Drew Ward, and others, the Nats have a boatload of prospects who could be used to acquire another reliever. After this deal, the current Nats bullpen is Doolittle, Madson, Matt Albers, Enny Romero, Oliver Perez, Joe Blanton, and Matt Grace, assuming Trevor Gott and Austin Adams go down to make room for the new guys. Those last three are some uninspiring names, though Koda Glover and Shawn Kelley are on the mend now. Despite the roster crunch that creates, adding another reliever in trade would solidify that group even further. If they could acquire someone like Pat Neshek, they could have Madson as the closer, Neshek and Doolittle as the left-right setup men, and Albers and Romero as the left-right seventh-inning guys, with Perez as a lefty matchup guy and Blanton or Kelley as mopup. Now that’s a playoff bullpen. This might require dealing or releasing Blanton or Kelley, though the problem can be avoided if another reliever gets injured or Kelley remains on the DL until September. At worst, they can eat Blanton’s cheap deal and hopefully get Koda Glover back in September for the playoff roster. If Glover returns before rosters expand, he can simply be optioned to the minors. As has been mentioned elsewhere, Doolittle and Madson have their own serious injury concerns. Doolittle is 30 and has missed a great deal of time since 2015 with shoulder injuries, which are scary stuff. Madson is 36 and missed three full years trying to come back from Tommy John surgery. While they’re under team control next year, what matters most is that both are healthy and extremely effective right now. 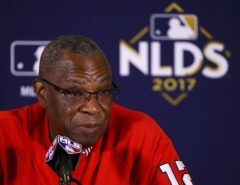 With this trade, the Nationals have added two current late-inning arms for a pretty low prospect price, even if their health is somewhat of a question. You can’t ask much more of Mike Rizzo.